New Graduate Student Orientation occurs during the week before the start of the fall and spring semesters. This comprehensive orientation event is intentionally designed to facilitate the academic and professional success of incoming graduate students as they navigate the transition to graduate school. New Graduate Student Orientation provides opportunities for students to connect with faculty, learn about campus resource and services, familiarize themselves with the campus, and begin to build community. The New Graduate Student Orientation program is designed to be a compliment to, and not a replacement for, any program-specific orientation activities planned academic departments. The orientation event features a welcome from senior university leadership, breakout sessions with program faculty and students, a campus tour, resource fair, workshops, a reception, free Monmouth swag and much, much more! Visit our Facebook or Instagram pages to see photos from the Fall 2018 Orientation! Held in April, Graduate Student Appreciation Days celebrate the contribution of knowledge, experience and energy of graduate students to the Monmouth campus community. Last year, our inaugural celebration included a Grab & Go Giveaway, happy hour, Instagram challenge, Grads Give Back, graduate assistant appreciation reception, de-stress activities, and free professional headshot photos. The Graduate Assistantship program provides opportunities for students to learn and evolve as developing professionals in training, to interact with, mentor, support and inspire both undergraduate and fellow graduate students, and to provide critical support to graduate faculty in the areas of teaching, research and writing. Over 185 graduate students participate in the GA program, serving in over 40 departments and units across campus, and approximately 1,400 credit hours per year are awarded to students for their service. The GA reception brings together graduate assistants, supervisors, mentors, faculty, staff and administrators in celebration of the tremendous contributions of our graduate assistants to the campus community and beyond. 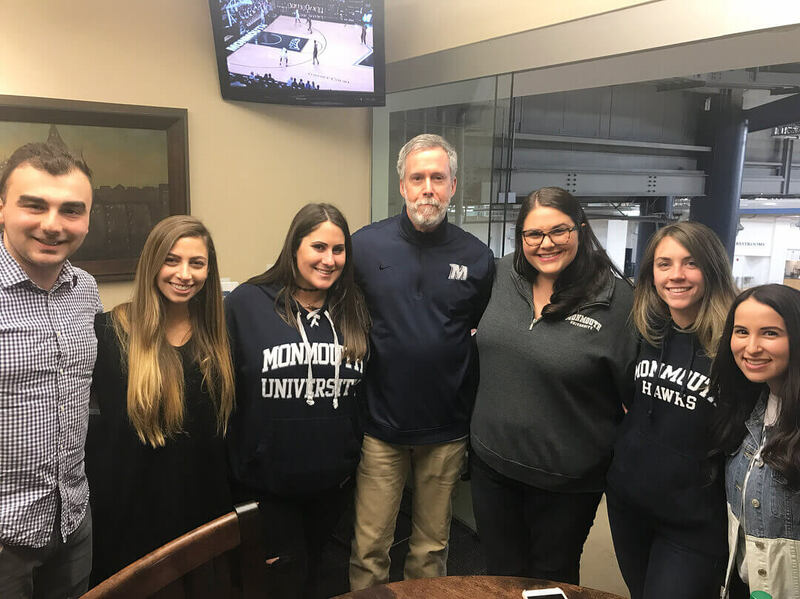 Grads Give Back provides an opportunity for Monmouth graduate students to engage with the local community through a day of service activities. This event usually occurs during the spring semester, and all graduate students are invited to participate. The Professional Development Workshop Series helps prepare students for life during and after Monmouth. Workshop topics may include, health and wellness, personal financial management, career services, effective communication skills, and leadership development. The workshops are held at various times throughout each semester. If you’ve got an idea for a professional development workshop, please let us know at gradlife@monmouth.edu! The period of time right before the end of the semester can be an especially stressful time for graduate students as they prepare for final exams, papers and presentations. De-Stress for Success provides an outlet for students to practice self-care and wellness in a fun and relaxing environment. De-Stress for Success activities include therapy dogs, coloring, chair massages, free refreshments, and much, much more!